August 3, 1937 Roland Wallace Burris, the first African American elected to statewide office in Illinois, was born in Centralia, Illinois. 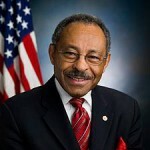 Burris earned a Bachelor of Arts degree in political science from Southern Illinois University in 1959 and a Doctor of Jurisprudence degree from Howard University School of Law in 1963. After graduating from law school, he became the first African American National Bank Examiner for the Office of the Comptroller of the Currency for the United States Treasury Department. From 1964 to 1973, Burris was employed at Continental Illinois National Bank and Trust Company and from 1973 to 1977 he served as Illinois Director of the Department of Central Management Services. In 1978, Burris was elected Illinois Comptroller, a position he held for three terms from 1979 to 1990. In 1990, he was elected Illinois Attorney General, becoming the second African American to hold that post in the United States. He served in that office until 1995. After several unsuccessful runs for other offices, Burris was appointed to fill the Senate seat of President Barack Obama in 2009. Burris did not run for re-election in 2010.